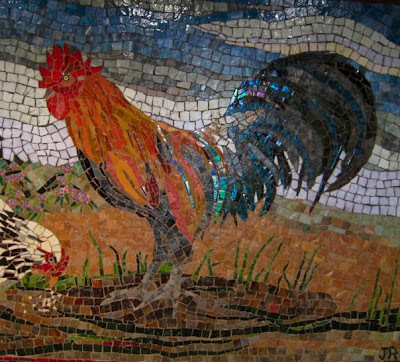 Someone just sent me these images of a Julie Richey original kitchen back splash. Wow. 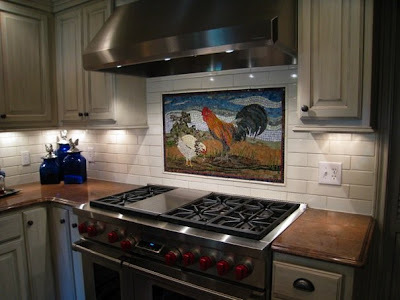 I am now rethinking every objection I've ever had to a rooster motif in a kitchen. Gorgeous stuff! I really like how it's cut into the subway stack. Amazing Work. Kelly and Jeff, go through Julie's website. In her kitchen gallery are some photographs of a back splash inspired by the caves of Lascaux. Glorious! Yes, those are my very own peachy-pink oak kitchen cabinets in that picture. Our makeover has been at a standstill while we've been waiting for the sink to arrive. Well, as of today, it's on its way -- YAY!! So we'll be able to get the countertop template made soon, and then it's demo time!!! Weeehooo!!! Ummmm.... if I decide to repaint the walls after all, do you have any colour suggestions?? Geez Kelly, you want to open that can of worms again? Hah! Are you talking about your kitchen walls? Don't they flow into another room? Isn't the cabinet color based on that wall color? If you want to start over from scratch, I'd start with Sherwin Williams 7037, Balanced Beige and then pull the cabinet color from that palette. Something like SW 7550 Resort Tan or... wait a minute the color codes are different in Canada. Don't paint the wall!